Home / Health and Vitality / Dried figs – the ancient superfood that’s brilliant for your bowels! Dried figs – the ancient superfood that’s brilliant for your bowels! Constipation is a surprisingly widespread condition that affects people of all ages and to varying degrees of severity. Many of us only ever experience constipation as a short-term inconvenience, yet for some it can become a chronic condition that causes significant pain and discomfort and ultimately affects their quality of life. In the worst case, it can also be a symptom of a more serious bowel condition such as bowel cancer, which is the third most common type of cancer in the UK. According to the NHS, eating high-fibre foods, drinking plenty of fluids and regularly exercising can help to prevent or ease constipation, whilst a diet high in fibre and low in saturated fat may also reduce your risk of bowel cancer. Fortunately, there are a number of fibre-rich superfoods that are especially adept at promoting healthy bowels and organic dried figs are arguably one of the finest. The fig tree, a deciduous shrub that can grow to 10 meters in height, is one of the first plants ever cultivated by humans. It is native to the Middle East and Western Asia and thrives in temperate regions that enjoy hot, dry summers and benefit from cool, wet winters. The fig is not actually a fruit at all, but rather an inverted flower that grows to between 3 and 5 centimetres in length and ripens from a deep green to a dark purple or light brown colour. Packed with crunchy seeds, this so-called ‘false fruit’ boasts an intensely sweet flavour and is bursting with wholesome nutrients. In addition to large quantities of fibre, organic dried figs contain vitamin B1, minerals – figs contain more calcium than most fruits and are an excellent source of both potassium and iron – and natural fruit sugars. Adding a daily serving of organic dried figs to your existing diet can therefore promote healthy teeth and bones, lower blood pressure and improve the transport of oxygen in your blood. And of course, they’re also brilliant for your bowels! Organic dried figs – brilliant for bowels! Fibre is essential for healthy bowels – fibre absorbs a considerable amount of water as it passes through your gut, subsequently increasing the bulk of any waste matter that leaves your body. This makes your faeces both softer and easier to pass. Yet most people in the UK don’t eat enough of this extremely important nutrient. The recommended daily fibre intake for adults is 18 grams a day – just one serving of organic dried figs (between three and five dried figs) contains a whopping 3.5 grams of insoluble fibre and 1.5 grams of soluble fibre, both of which are extremely beneficial for sound gastrointestinal tract health. This type of fibre cannot be digested. It passes through your gut without being broken down and helps other foods to move through the digestive system. Insoluble fibre forms soft, bulky stools that can pass more easily through the intestines thus preventing constipation and other bowel problems, such as diverticular disease (a condition in which the bowel wall becomes inflamed and damaged). This type of fibre can be digested by the body. Like insoluble fibre it can help to soften your stools and make them easier to pass. It also binds with fatty acids to form a gel that encourages a slower digestion, making you feel fuller for longer, an added advantage if you’re trying to lose weight. As well as improving bowel health, fibre also slows down the absorption of carbohydrates into the blood, which can help stabilise blood sugar levels, making organic dried figs of particular benefit to those suffering from diabetes. Organic dried figs not only provide a welcome supply of soluble and insoluble fibre, they’re also a delicious addition to your daily diet. Organic dried figs can be enjoyed as a tasty snack straight from the bag or added to breakfast cereals, salads, trail mix, raw chocolate and desserts. 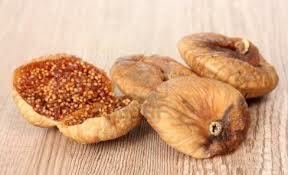 The post Dried figs – the ancient superfood that’s brilliant for your bowels! appeared first on Superfood blog - Healthy, Rawfood Lifestyle.